University of Florida Health has enrolled its first patient in a landmark clinical trial to study the effectiveness of three hepatitis C medications. 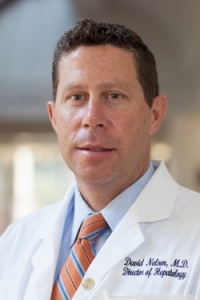 The initial patient has begun a 12-week drug regimen and is one of 3,750 people who will be randomly assigned one of the medications as part of the five-year trial, said David R. Nelson, M.D., director of theUF Clinical and Translational Science Institute and a professor of medicine in the UF College of Medicine. A $14.97 million research contract from the Patient-Centered Outcomes Research Institute, or PCORI, is funding the trial, known as the PRIORITIZE Study, at UF Health and 45 centers nationwide. In addition to comparing the effectiveness of the three oral medications, Nelson said researchers will learn more about how the treatments perform when used by a diverse group of patients that includes minorities and people with other medical conditions. PCORI decided to fund research about the efficacy of hepatitis C medications because they were only tested previously in carefully selected patient populations and never against each other. That leaves physicians and patients with no comparative evidence about the drugs’ effectiveness. Pragmatic clinical studies test a treatment’s effectiveness in “real-life” situations, such as typical academic and community-based outpatient clinics, and also can include a wider range of study participants, making their findings more generally applicable. “Most clinical trials are done in a very selective group of otherwise healthy individuals. We know the real world is quite different. It involves a diverse group of patients — people who may be older, have a lot more health disparities and get their health care delivered in many different ways,” said Michael Fried, M.D., a co-principal investigator and a professor at the University of North Carolina School of Medicine. The study is comparing AbbVie’s Viekira Pak, Gilead Sciences’ Harvoni and Merck & Co.’s Zepatier, which was approved earlier this year by federal regulators. AbbVie and Merck are providing free medications and support worth hundreds of millions of dollars for the trial. Such a large, ambitious and expensive clinical trial couldn’t happen without a unique partnership involving the nonprofit PCORI, the pharmaceutical industry, patient stakeholders and academia, Nelson said. “I’m trying to understand precision medicine — which drug would be preferred in which person — and the only way to do that is to compare them in a big, broad population,” Nelson said. The first safety and efficacy data are expected in mid- to late 2017. The stakes are high for hepatitis C patients and for pharmaceutical manufacturers. The blood-borne virus causes a liver infection and is the leading cause of liver cancer worldwide. Many people with chronic hepatitis C are undiagnosed and do not have symptoms, but about two-thirds will develop significant liver disease if the condition remains untreated. There are an estimated 100.2 million hepatitis C patients worldwide and treatment costs are expected to reach $10.8 billion globally by 2022, according to figures published in the journal Pharmacy & Therapeutics. In addition to the drugs’ effectiveness, Nelson said the long-term nature of the trial will also yield a trove of research samples and data that could answer questions about improvement in patients’ livers and overall quality of life following hepatitis C treatment, as well as changes in liver cancer risk after treatment with this newest class of drugs. “No one has ever done a long-term, controlled trial with these drugs. The really rich nature of this study is that we’re going to be following a huge cohort of patients, all with the same disease, and hopefully most of them will be cured. We will be able to assess the impact of that treatment and potential cure on the next five years of their lives,” Nelson said. For Summer Wadsworth-Delciotto, who co-chairs a group of hepatitis C patient consultants working on the research team, participating in previous clinical trials of hepatitis C treatments was a life-changing experience. Not only was she cured, but also the clinical trials were a way to help others. “We now have highly effective, relatively painless treatment options for hepatitis C. As patients, we have the opportunity to share our treatment experiences with other patients as well as the medical community. (For others), participating in this new study is a way to lend a voice to the direction of medical treatment,” said Wadsworth-Delciotto, of Pittsboro, North Carolina. The trial is also getting a boost from TLCRX, a specialty pharmacy that partnered on the project to handle the complex task of distributing medication to thousands of patients around the country. South San Francisco-based Monogram Biosciences is performing viral resistance testing for all patients and collecting research samples from patients in 40 states, while the UF Clinical and Translational Science Institute is serving as a biorepository, according to Nelson. At least 100 patients will be enrolled through UF Health, which will also get about $6 million of the PCORI funding. Other lead sites for the study include the University of Michigan, The Johns Hopkins University and the University of North Carolina.